"Flatiron Building, New York." The Manhattan landmark under construction circa 1902. 8x10 inch glass negative, Detroit Publishing Co. View full size. Submitted by David Dyer-Bennet on Wed, 01/13/2010 - 12:58pm. I love this building. I've visited Tor in their offices there (hi, Moshe!) and got to look out, as well as seeing the place from the outside. It's wonderful. Submitted by Central Harlem Anonymous on Tue, 01/05/2010 - 4:52pm. Generally speaking nowadays when buildings of this era are renovated, damaged or missing pieces of decorative masonry are replaced with fiberglass replicas. These cost much less than stone and are easier to install. The exterior of Shepard Hall at CCNY, for example, would probably blow away in a strong breeze. A few years ago, when the Flatiron building underwent a significant cleaning, tons (literally) of the decorative stonework was discarded in favor of replicas. Friends of mine who lived nearby dug through dumpsters and collected pieces they could cart home as souvenirs. Thanks to Team Shorpy for these excellent New York images. Submitted by Moshe on Mon, 01/04/2010 - 10:19pm. Like most of you, I've always loved this building. I've also had the privilege of working in it, on the 14th Floor (for Tor Books, a company I now consult for, so I'm still there periodically). 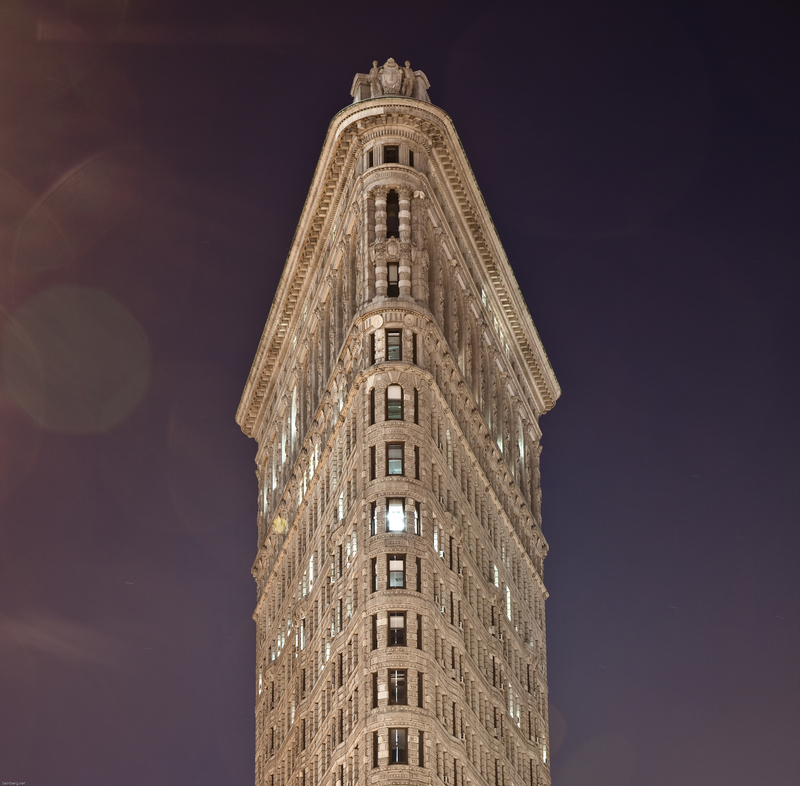 There are lots of interesting facts about it, such as that the Flatiron name predates Fuller's construction of this icon, being applied to the block itself in those days. I first visited the building in the 70s, when I applied (unsuccessfully) for a job at St. Martin's Press, which is still there. Back then, the building still had its original painfully-slow hydraulic elevators. Those were replaced before I began working there in 2000. What I was most surprised to learn after I began working there is that almost all photos taken of it are misleading. So what was the surprise? Its footprint (or floorplan, if you prefer) is actually a right triangle, with the long side on Broadway. As you'd expect, the view from "the point," as occupants call it, is fabulous, looking straight uptown toward the Empire State Building, and down on Madison Square Park. Submitted by Lileks on Mon, 01/04/2010 - 12:28pm. The Fuller Company made sure their next HQ didn't get renamed by popular fancy: they set the name in stone over the door, and there it remains to this day. Submitted by hillie_bolliday on Thu, 12/31/2009 - 11:25pm. Gorgeous building and the longtime object of my faraway architectural dreams. It's on my so-called bucket list to see this beauty in person some day. Submitted by Anonymous Tipster on Thu, 12/31/2009 - 6:43pm. I wondered where all the water was coming from & then I spotted it, maybe: up the street you can see a wagon with a rounded tank and what looks like water spraying from the back. Looks deliberate, unless the wagon got up enough speed for the wheels to do that. What could it be? Dust Control? Submitted by Doohickie on Thu, 12/31/2009 - 5:41pm. Somehow it seems like this icon has always been. To think of it as being constructed is, well, kind of freaky. What a visionary design. Submitted by Anonymous Tipster on Thu, 12/31/2009 - 4:45pm. As noted elsewhere, by this time most of the streetcars in New York were running on electricity, with the electric supply on almost all the lines being underground. The same plow-and-shoe system as used in Washington, D.C. Submitted by Seinberg on Thu, 12/31/2009 - 10:28am. The detail on this building is really mind-boggling. Definitely my favorite building in Manhattan. Click to enlarge. Submitted by Bob Wilson on Thu, 12/31/2009 - 8:28am. I'll take footage on the 18th Floor facing north, please! Submitted by cribsie on Thu, 12/31/2009 - 4:00am. One of my favourite buildings and, speaking as a Brit, a real iconic image of New York. Stunning photo. Submitted by carbidelight on Wed, 12/30/2009 - 11:21pm. The lone auto is I believe a curved dash Oldsmobile. Note the tiller steering. Probably scared the horses half to death. Submitted by Dave on Wed, 12/30/2009 - 11:15pm. Is limestone and glazed terra cotta. I looked it up in Wikipedia. Submitted by pedrocooper on Wed, 12/30/2009 - 10:24pm. Skidoo! The building that coined the phrase due to the updrafts. Submitted by Chuchundra on Wed, 12/30/2009 - 8:54pm. Flatiron is my favorite building in Manhattan. This is a super shot. Submitted by Rip Tragle on Wed, 12/30/2009 - 8:53pm. But I still can't understand why the stonework was interrupted between the 4th and 5th floors and continued above. One would think they'd start at the bottom and continue up. There must be a reason. Submitted by Rollo Jenkins on Wed, 12/30/2009 - 5:42pm. The Flatiron Building and the Chrysler Building in NYC are two of the most beautiful structures in the United States. To see them in person and to tour them is an education in itself! Submitted by FortWorthGuy on Wed, 12/30/2009 - 5:12pm. The contractor was a major player in the field of early skyscraper construction. Fuller built many buildings that are still around today and was credited with many innovative techniques for this type of construction. The company was liquidated in the 1970s. Submitted by rhhardin on Wed, 12/30/2009 - 3:56pm. Is there voltage under that third rail? It would short out all the time in rain, so it's doubtful. Submitted by swein on Wed, 12/30/2009 - 3:16pm. What I find fascinating about this photo is it shows the transitional nature of tall construction at the turn of the century. The steel frame here is clearly very sturdy and over-engineered, and yet they're wrapping it in brick and massive stone blocks, and not curtain-wall hung panels as would become the norm in 20 years or so. Submitted by Anonymous Tipster on Wed, 12/30/2009 - 1:10pm. Everyone should stand at this intersection someday: Fifth Avenue on the right; Broadway receding into the distance on the left; 22nd Street running behind the building (where the buggy sits at the corner under the "Slosson" sign); 23rd Street just below the bottom edge of the photo. Stand on the sidewalk right at the rounded (northern) corner of the building, where today there is a Sprint cell phone store, of all things, and contemplate a city street scene from a century ago, filled with horse-drawn buggies, street cars, and Victorian finery. It will take your breath away. Submitted by nixiebunny on Wed, 12/30/2009 - 12:39pm. Applying the skin stones looks like a job for the non-timid. Those scaffolds are hung from ropes! It's interesting to see how things were done before the invention of the tower crane. That boom on the right and the one on the roof did all the heavy lifting of stones and beams, I'm guessing. Submitted by Anonymous Tipster on Wed, 12/30/2009 - 12:34pm. Submitted by 24gotham on Wed, 12/30/2009 - 12:27pm. 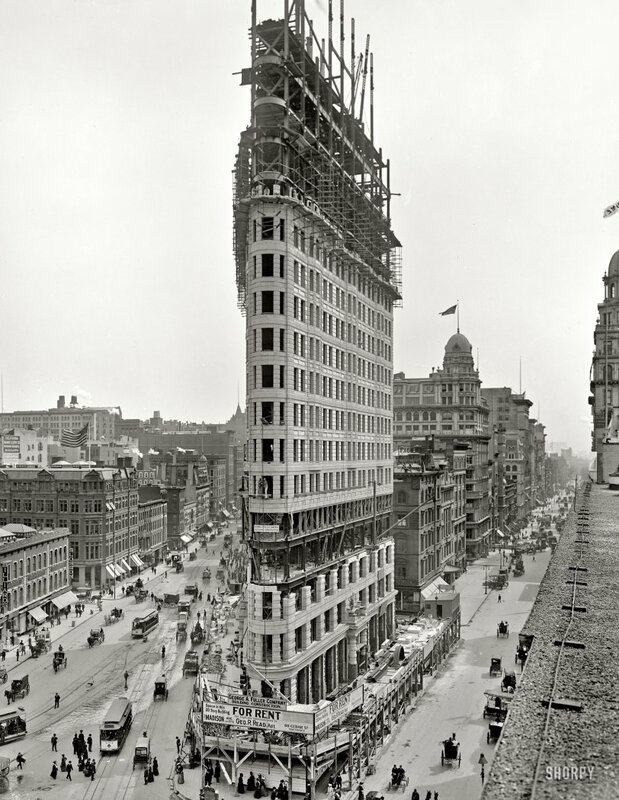 This is absolutely one of the best early shots of the Flatiron I have seen. The detail is amazing, and there are so many of the surrounding buildings still there today. Thanks for posting! Submitted by Jon on Wed, 12/30/2009 - 12:05pm. I love shots like this -- it's like "I Spy." Submitted by Anonymous Tipster on Wed, 12/30/2009 - 11:40am. I think it's an amazing building. A work of art indeed! Submitted by Anonymous Arkie on Wed, 12/30/2009 - 11:03am. An icon in the making and the photo shows what we can't see today: the skeleton of this wonderful building before the "skin" was installed! Great find! Thanks, Dave. Submitted by radioflyer_ on Wed, 12/30/2009 - 10:50am. Note one horseless carriage lower right. Right smart fellows I reckon.